The preorder discount of $4US per Massacre kit has been extended until the end of next week - 11:59 PM CST on November 6th. You can find the discount code on each kit's product page. Also, if you purchased a stage 1 kit from us and would like to preorder standalone polycarbonate stage 2 parts, they are available for $17.99US each (including a $2US preorder discount per kit). You'll only be able to order standalone stage 2 polycarbonate kits until November 30th. This deal can be pulled any time without notice, so stock up on their high quality springs. 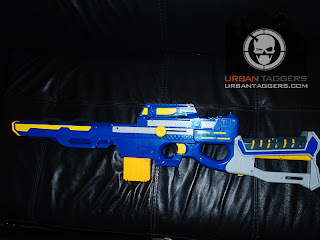 Airzone Quickfire Sniper: It's kinda.. BIG. 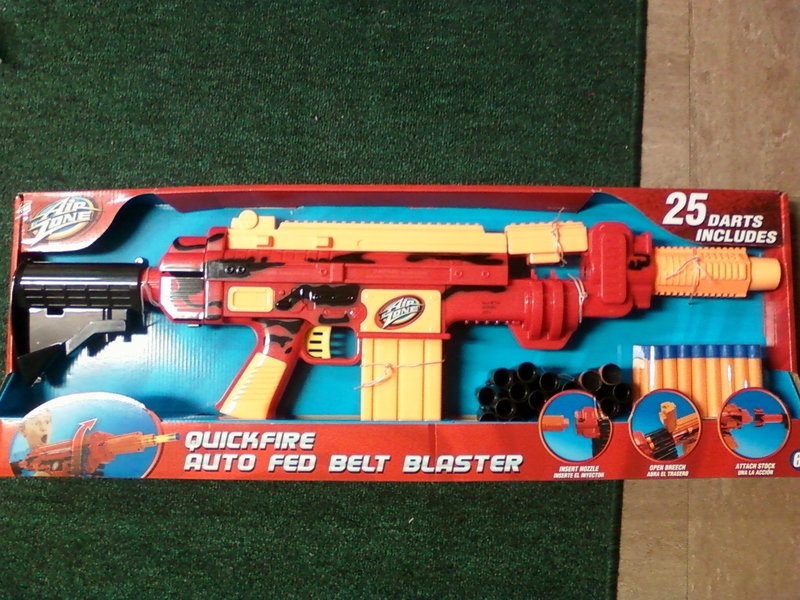 The Quickfire 6 is a clip fed 6 round blaster from Toys R Us' in-house brand 'Air Zone.' 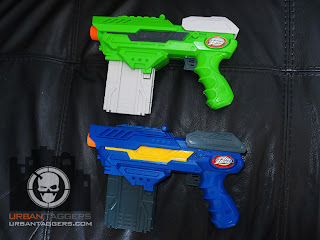 In the past Air Zone was a little touch and go, but recently they have been bringing out some pretty decent blasters of late with both decent performances and aesthetically pleasing designs. Although Air Zone is essentially rebadged Lanard/Dart Zone/ X-Shot/misc gear, at least the person who's selecting the gear to do this is doing a great job. Sooo.. you ask, and we do our best to accommodate! I may not be proficient with a screw driver, but Neil's enlisted master weapon-smith Chris Wolfe and his Make Hack Void fellas to do a lil surgery on the upcoming Rayven CS-18 blaster. Here are some exclusive pics of a cracked open Rayven to give you all a first look at what's inside. 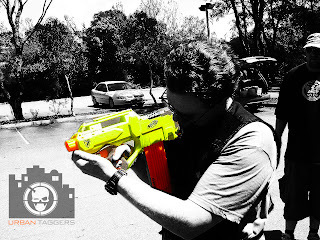 There's a pretty strong likelihood that regardless of whether you're a technical modder, aesthetic modder, out of the box fan, HVZ/dart tag warrior or just a 12 yo kid; whether you like to role play, showcase in cabinets or crack things open to see how they work.. the fact that you're reading this now means you love toy blasters. It's a weird and wonderful passion that we have and we all come to it from various backgrounds. I myself came from it due to the fact as a child, I was very very poor and didn't have a whole lot of toys let alone blasters. 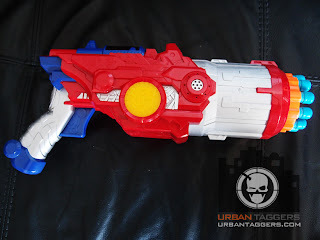 I like the toy element (blasters are not the only toys I collect, which anyone who shows up at my place can attest to) of it all, enough so that I would dedicate so much of my spare time to managing a whole blog about toy blasters. Everyone else in my world thinks I'm nuts. Nerf N-Strike Rayven CS-18 – Battle Test! 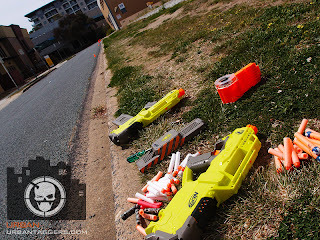 Our man Neil took the range tests for the Rayven CS-18 one step further and brought it into a Nerf war situation to see how it faired in "real world" battle. If you've seen the videos to date, you'll know that with voltage mod, these puppies are making some pretty impressive ranges, but how does that fare when under fire from others? We only had a short amount of time to get these done, but Neil and I managed to shoot several quick vids to give you an idea of ranges for the upcoming Rayven CS-18. Outdoors in a quiet urban street in the city; minimal wind; the cones are measured out in 10 metre lengths; the first 5-6 shots were shot straight, while the rest of them were shot at an angle. 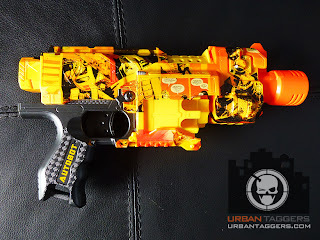 We used the Rayven's 18 round clip, older and newer streamlines ( traditional, reds, camos and whites) and we tested it with new Duracells, and higher voltage trufires. By request, the upcoming Nerf N-Strike Rayven CS-18 with the Spectre REV-5 barrel extension. Other than the colour, it works pretty well. More pics after the jump. 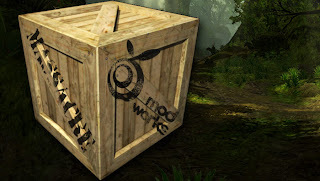 "The Massacre kit is our Recruit Level kit, and it contains everything you need to get started. These upgrade kits are intended to be introductory level and somewhat universal in style for each blaster. The MASSACRE system will introduce additional kits to further upgrade and designate a specific role for your blaster, but the Recruit Level kit will be the starting point for any further upgrades." Estimated Release Date: Between December 1, 2011 and January 15, 2012. Also available are silicone grease and O-rings, and 5 or 6 KG performance springs for your Recon, Raider, Longstrike and AT. 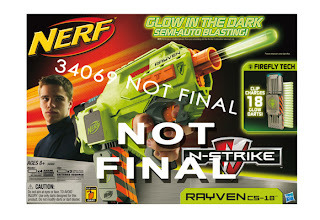 Preview: Nerf N-Strike Rayven CS-18. Tacticool just got cooler. You'd have to suggest the hottest blaster this year that just came out of nowhere is this upcoming Nerf Rayven N-Strike CS-18. 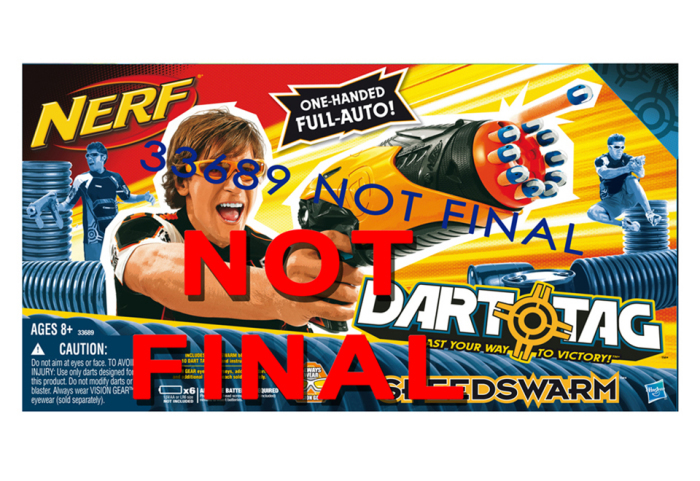 Speculation has been thick and fast over the past few weeks since we posted links to blasted.de of the upcoming blaster; I can confirm on the whole our switched on readers were pretty accurate in their observations from a few blurry pics. It IS a rear vertical flywheel blaster but one that uses an 18 round clip to fire streamlines. Bumblebee Transformers Blaster.. Whoo hooo! NEW NEW NEW It's awesome and all the cool kids will have one. 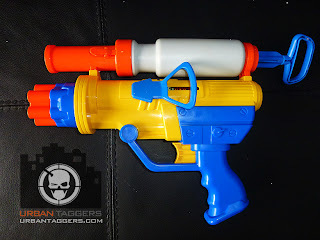 Another one from 'Arsenal Toys' is the Mortar and Rifle (which we'll call the M+R as of now) , which is a combo unit that incorporates a pump air pressure "mortar" on top of a six shooter dart blaster. It features the classic Arsenal Toys quirky "minimimalist" styling and like the Machine Pistol we reviewed earlier, it looks more like a prototype concept unit rather than a finished product. That all being said, in a classic case of "it's what's inside that counts", we've got ourselves another unit that had very surprising performances..
Arsenal Toys Machine Pistol. For something different.. I personally like it, mainly because I am a Transformers fan and really dig IDW's artwork, which is the house that designed the graphics for this release. Again, the changes are purely aesthetic, so there's not much else I can really say about it other than check the pics after the jump. Those green darts we posted on a few days ago that Neil saw on eBay are for the Stampede; the bipod as you can see will be orange but the disappointing thing for me is from this pic, the shield won't be translucent which I thought would be pretty cool. Ahhh well. Still looks pretty sweeeeeeet.. Apparently scheduled for a December, and obviously Christmas release. 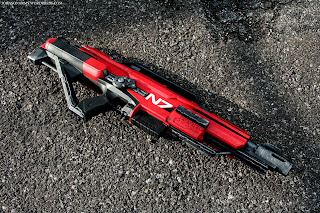 Flash forward to current day, and that deviant ART profile of "bcjfla76" is none other than Johnson Arms; since then quite probably the most well known and loved aesthetic modder in the world. Brian's work is incredible and has been showcased everywhere, including the big guns in IGN, Kotaku and Game Rant to name a few. And it's nice to know fame hasn't gotten to his head- he's still a nice guy:) Here's to you Mr Johnson; what a year eh?! 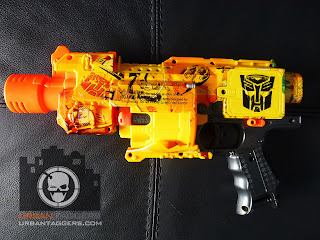 Light Strike/Stampede Integration. SO Cool. These good folk at new blog "The Hive Mind" however are not. 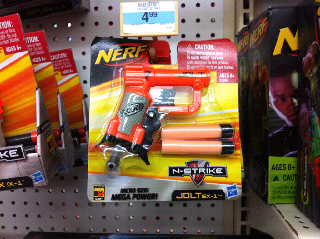 They've managed to fit a Light Strike tagger into a Nerf Stampede ECS. And I was impressed. VERY much so. Check out the link below for more deets. Retro: Super Soaker CPS 2500. That's tuff. I've been on a roll with the acquisition of retro Super Soakers lately, and I have to admit I was absolutely stoked at this latest find. The Super Soaker CPS (Constant Pressure System) 2500 is one of the all time Super Soaker fan favourites from 1998 and is one of the most powerful water blasters ever made other than it's legendary older brother in the CPS2000. 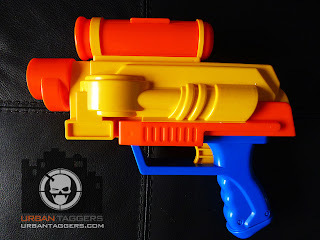 I owned one back when they were released but it was unfortunately thrown out when I was not about; you can imagine how upset I was as even second hand units these days normally go for quite high prices on eBay, being quite popular with collectors and seasoned water fight affectionatos alike. 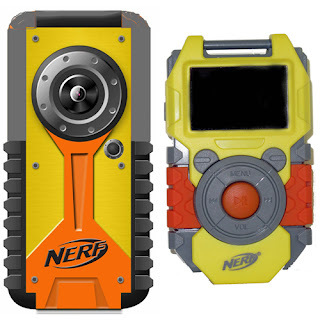 Similar article to the one we posted last week of the new Sakar produced Nerf branded gear, but this is just an updated photo with what looks like the MP3 player next to the handheld cam. Cheers Carl for the lead. 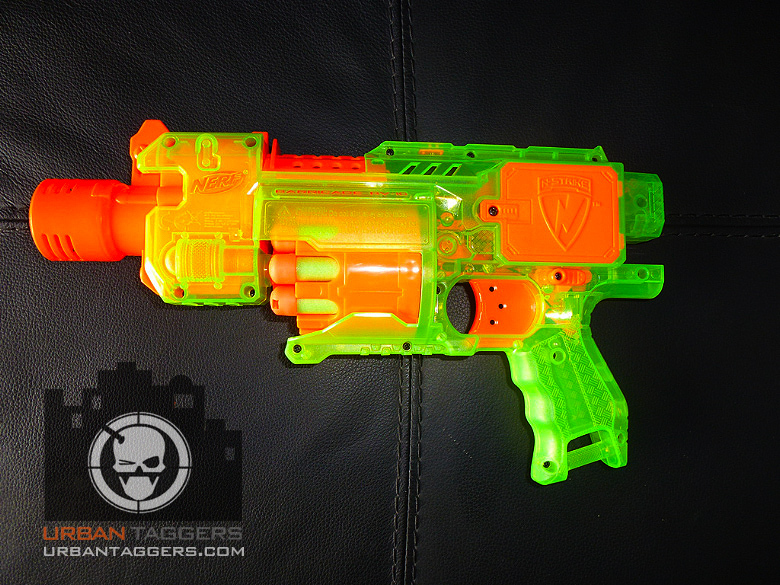 Rumours: Rayven CS-18 first look! 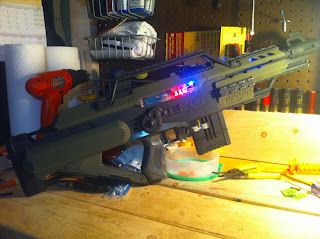 Sent to us from a reader known as "Clu", this looks like a first look at the much speculated Rayven CS-18. 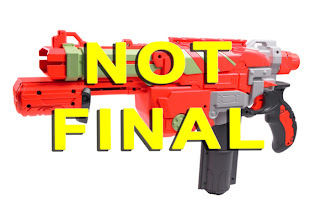 The image was TINY and unfortunately quite poor quality but I've done everything I can with it to enhance the detail; it might look different in the end but it at least gives you more of an idea of what the upcoming blaster is going to look like. 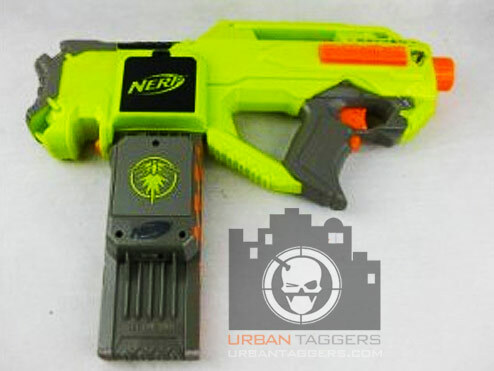 Still rockin' the lime green, you can still see the N-Strike logos and the use of the orange and grey accents. 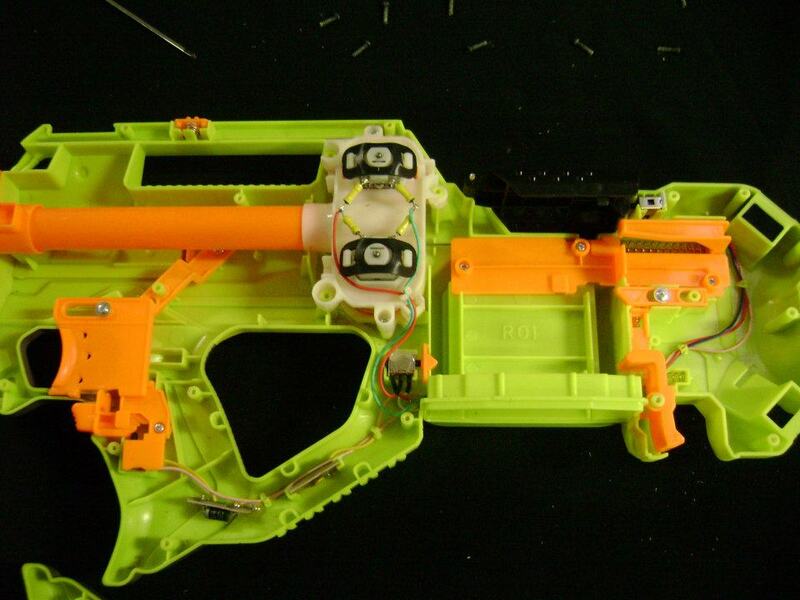 By the looks of the button under the trigger, it will be a similar mechanism as the Vortex Nitron to activate/operate the blaster. Happy to hear your views though.. does it still interest you? 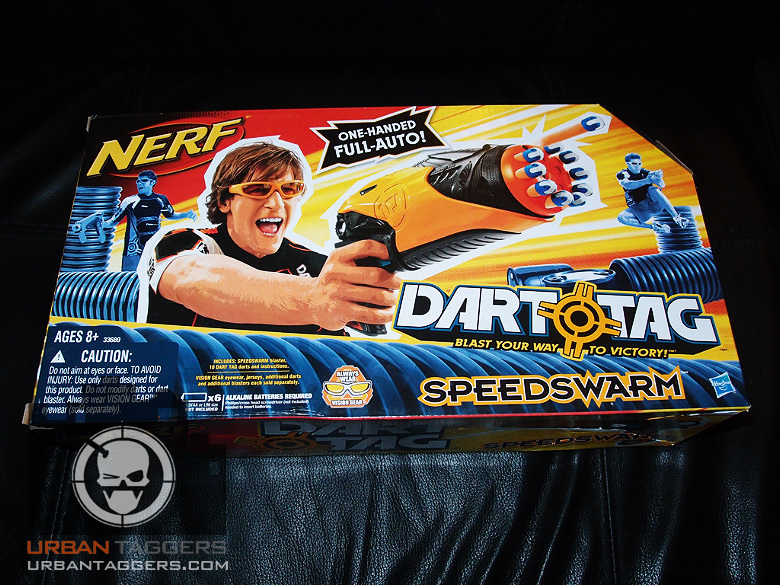 SG Nerf: Nerf Dart Tag Speedswarm - Review! 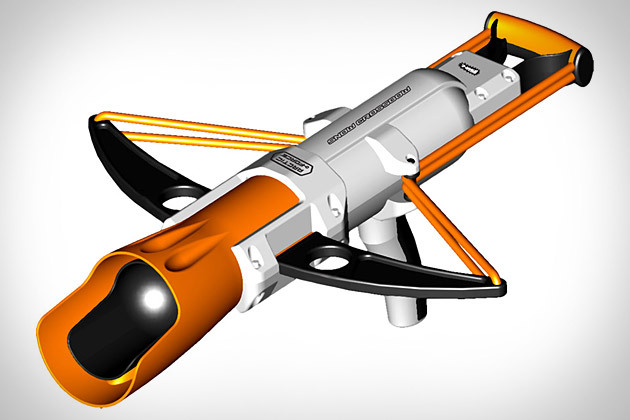 "The Nerf Speedswarm is a fully motorized spring-powered direct plunger blaster. 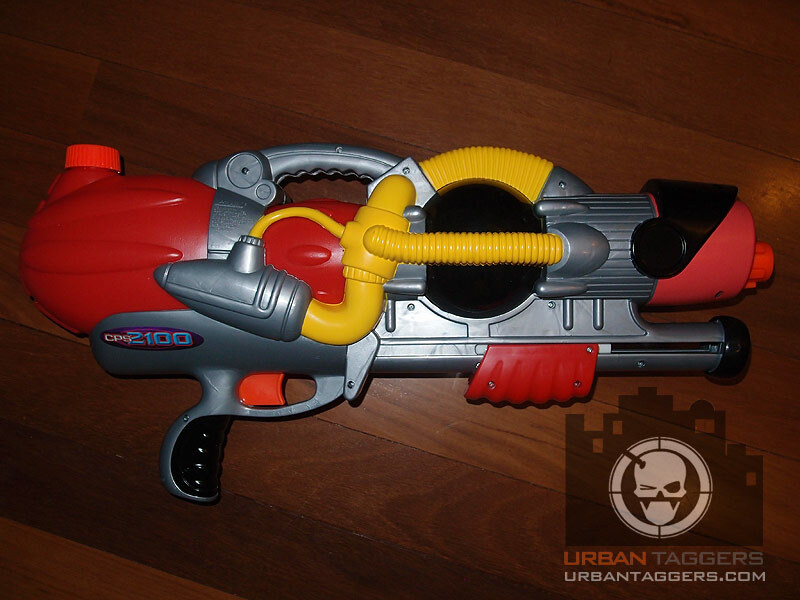 The blaster requires 6 x AA Batteries to power its motor (Batteries sold separately). Its rotating barrel has a 10-dart ammo capacity. 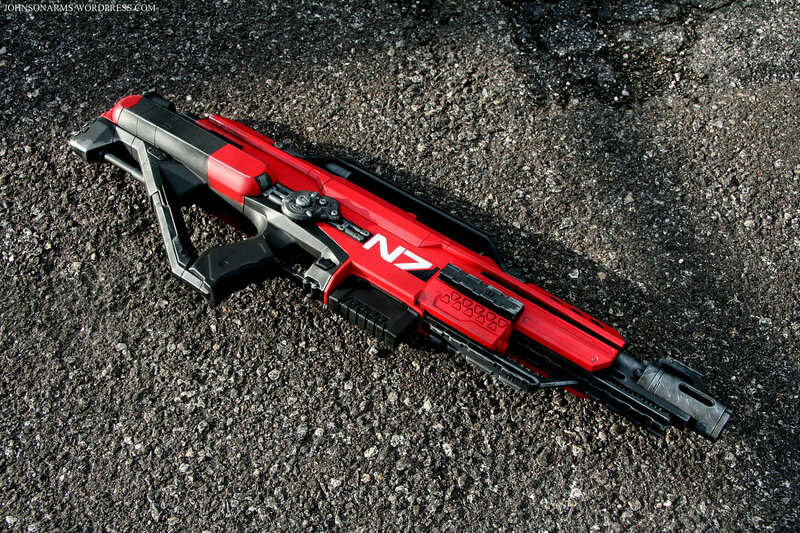 Its firing system is fully motorized, there is no manual priming mechanism (without any batteries, it cannot fire). The Speedswarm can fire in full auto or in bursts, depending on the duration of trigger pulls. Firing single shots at a time can also be done by simply pulling the trigger briefly and letting go. Its all in the timing of the trigger pulls." 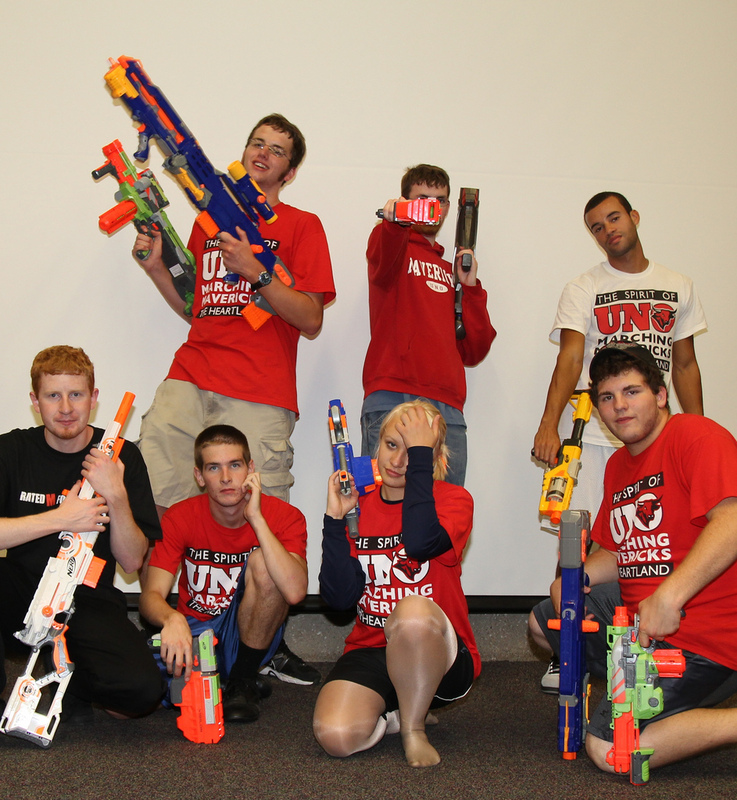 More pics at SG Nerf. Want more Sonic Series? Spotted in a US Toys R Us at Huntington, West Virginia. Thanks for the Gray House for the lead. 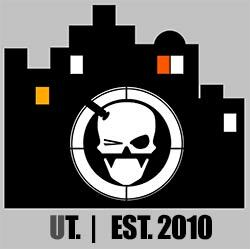 Here's probably something many of us have talked about but haven't gotten around to formally doing; Mike from Tactical Tag has gotten some of his peeps together and in the interests of research, conducted an N-Strike vs Vortex indoor Nerf war. How'd it all go? Check out Tactical Tag for detailed results! 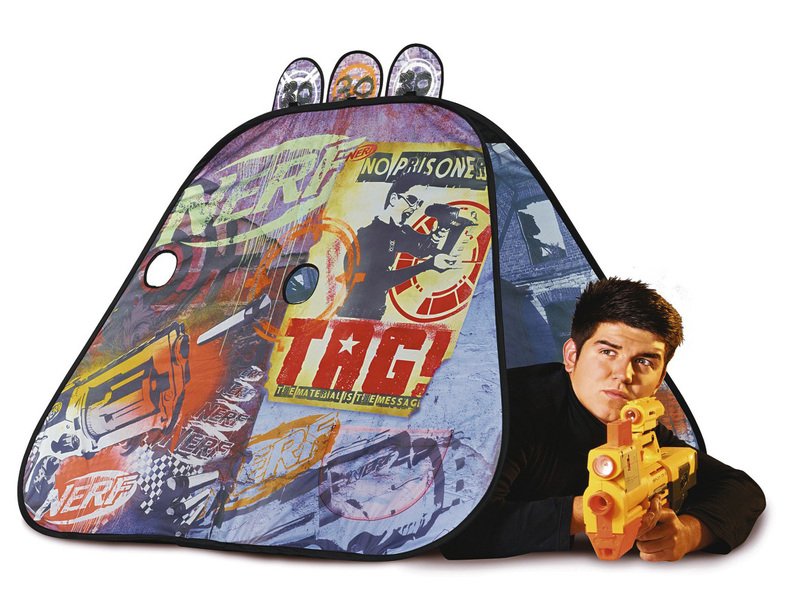 In what sort of looks like a glorified tent, here we have a 'Nerf Double Blockade'. I've never seen these before, they just sprung out of nowhere while doing some Google searches. 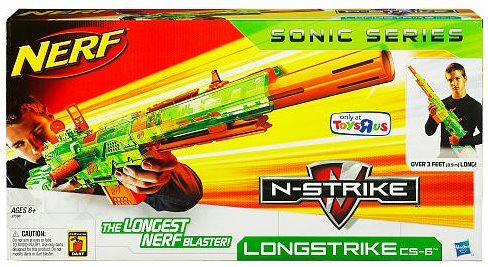 Looks like something only available in the UK..
"After I shoot you, maybe I can tell you scary stories and toast marshmallows"
The colour scheme does look abit like N-Strike and Vortex had a love child, but much of this could be due to the fact the box art is clearly "NOT FINAL". That also being said, this is the first time we've seen this, so it sits in the rumour mill till we can confirm or deny. The story behind it this leak though is however does come from a fella asking for info at his local retailer so it's looking pretty accurate thus far. 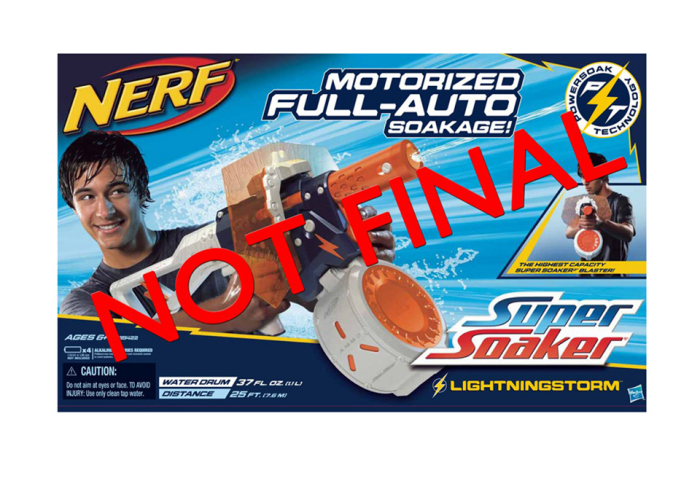 You can't say Nerf ever rest on their laurels of success; browsing German store tsbz.de came up with an image of "Not Final" Box art for a new Super Soaker blaster called the Lightning Storm. 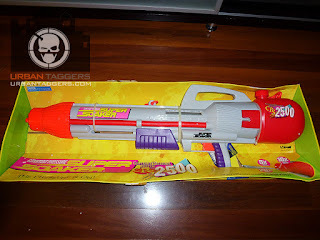 From what we can tell, it uses a 1 litre water drum (that we'd have to assume is compatible with the other clip system blasters like the Thunderstorm and Tornado Strike) and claims to be the highest capacity Super Soaker blaster (well.. highest capacity of the CURRENT range). I'm guessing the 'Powersoak Technology' and the fact it takes 4 batteries suggests it's another motorised blaster. And it has a shield that actually looks like it'll be able to fit on tactical rail compatible blasters properly, unlike the weird styling of the Hydro Cannon's. 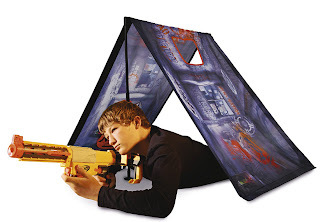 Air Zone Quickfire Sniper • Ages 6+ • $29.99 Think you’ve got what it takes to be a sharpshooter? 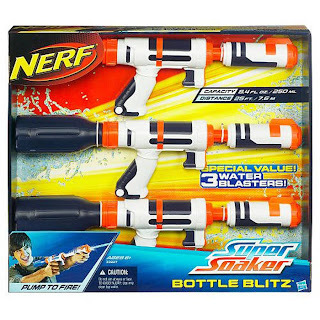 Grab this huge 37.5-inch long blaster, load six darts into the clip, snap in position and let it rip—up to 30 feet away! 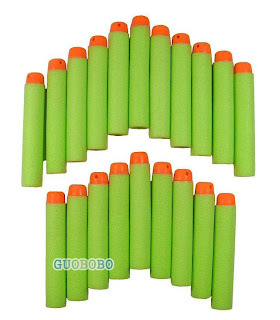 Wrap both hands around this brightly colored shooter and aim. Features include a built-in scope, recoil shoulder stock and choice of short-range, long-range or sniper modes. Rumours: Nerf Vortex Lumitron - is a Praxis? A reader m4rsmensch (thanks! )brought to our attention an interesting image of a Nerf Vortex "Lumitron". 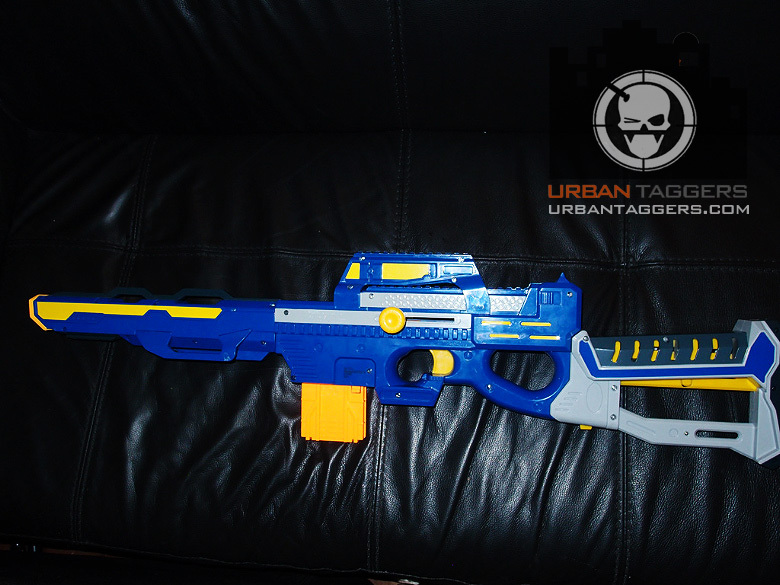 It looks just like a Praxis, but with different colour scheme, without a stock and with an 20 round clip. It's true names of blasters are often different depending on the country but i'm PRETTY sure the Praxis.. is called the Praxis in Germany. The image as you can see is 'Not Final' so it could just be that this was an early image of the Praxis that somehow ended up public. Or it IS an actual repaint. 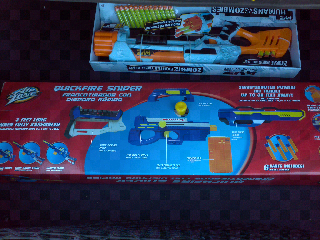 Or... it could be a place holder image and the "Lumitron" is a completely different looking blaster. Speculations!!! 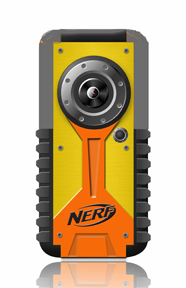 A pic from twice.com that looks like the upcoming Nerf pocket DVR. Is it likely to make you want to buy it due to the Nerf branding, or would you just prefer getting yourself something like a Flip instead? Cheers Carl for the lead! Regardless of actual performance, traditionally flywheel blasters such as the Barricade RV-10 get a pretty bad rap with the toy blaster community, mainly due to the noise they make and hence the inability to use them in "stealth" missions. 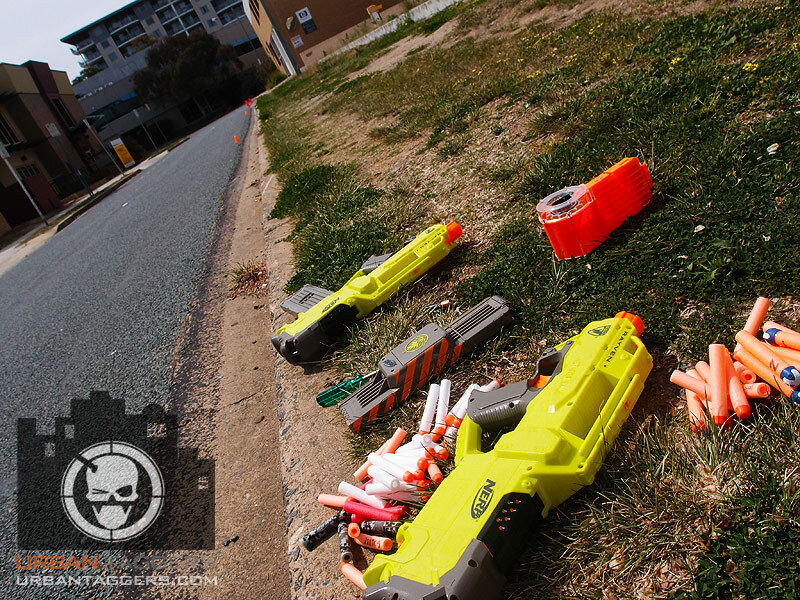 The thing is, there are PLENTY of blasters out there that you could use for a 'stealth' mission so I'm not sure why you would use a flywheel blaster for this purpose anyway whereas they make perfect sense in an open field firefight (which so many Nerf wars end up being anyway). Adding to the fact that a flywheel blaster is probably the easiest to increase performances; whether you call it 'amping', 'juicing', 'upping' or 'vodding', increasing the voltage of a motorised flywheel blaster can turn a good blaster into a great one. Our man Neil's an absolute convert now- check out his rant after the jump. 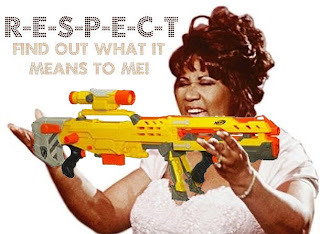 This vid reminds me a lot of when I was a kid and we were too poor to afford toys (and a very anti-gun father meant I wasn't allowed to even be given any from relatives and family friends) Soo.. I ended up making my own from a library book which showed me how to make a fully functioning rubber band gun out of cardboard and split pins. This home made paper clip gun takes the rubber band concept and launches paper clips, which I'm guessing will sting and probably shouldn't be aimed at anyone's face (or any other body part for that matter!) but still made me smile. Cheers Ryan for the link. Thanks to Phil for the heads up! 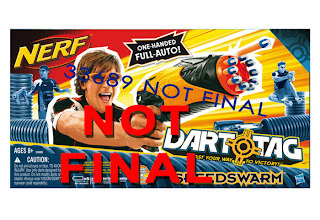 If this is real.. Nerf need to really drop their PR company..
Several emails and msgs to us this morning have prompted us to post a response to this "promo" spotted on the Nerf Nation Facebook page but only in the uploaded photos area. Personally, I don't think it's the real deal. If it IS, it's riddled with dodgy all over it and you have to wonder what's going on with Nerf's PR peeps. The ad uses a poor text layout and is lacking in right justification. The "Nerf" text at the beginning has an odd font that isn't associated with any of the branding. The rest of the text is using a bolded arial font which is not easy to read and quite amateurish to look at. 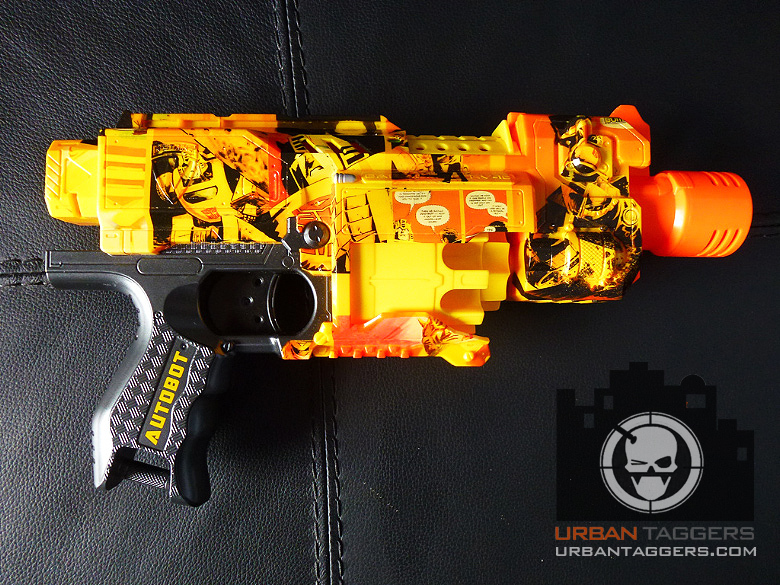 The orange is not an official Nerf branded orange. This doesn't look like the work of a professional graphic designer. It could have been done in MS Paint. The first sentence is poorly written and makes no sense. 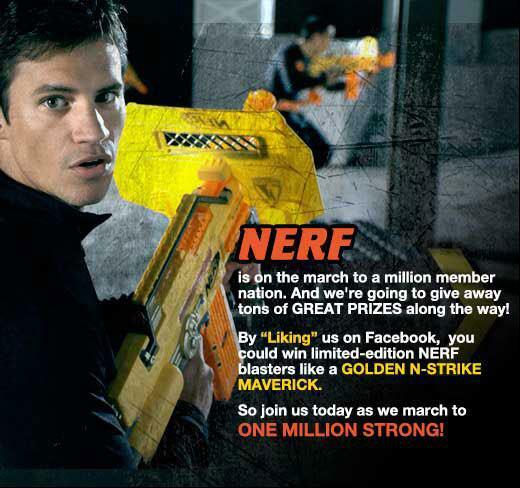 In official promos, Nerf tend to refer to their blasters as the full name "Maverick REV-6" not just 'Maverick'. The "Liking" us uses a capital 'L' and quotes which is off. What is "march on"?- there's no context behind the use of this term. The term "tons of.." is rarely used in marketing promo as it can be taken literally and a company can be considered to be misleading the public if they DON'T give away "tons" (by weight) of product. It's also a very odd way for Nerf to promote something; they normally make an official announcement on the page- which I don't see. 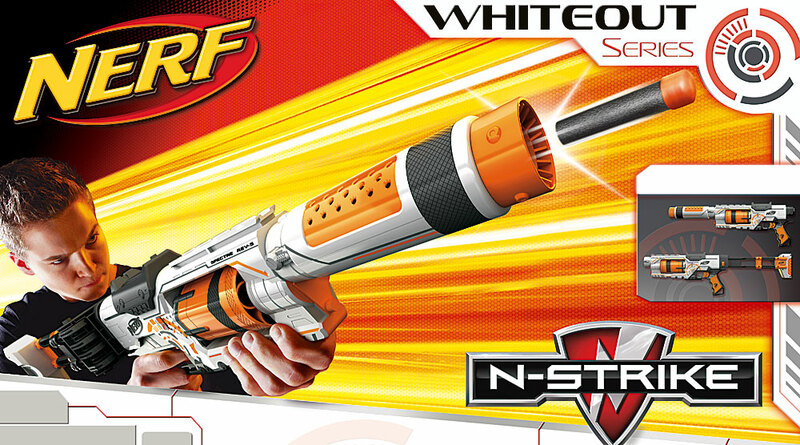 Coming soon to a Toys R Us near you (if you're in the US), it's announced that Nerf have teamed up with electronics manufacturer Sakar to pop out some very interesting supplementary gear to their blasters. Last year there were things like speaker docks, but this time it looks like they'll be releasing kit that's more relevant to the Nerf brand. 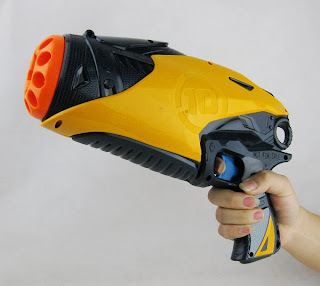 "Specially engineered and molded to resemble the distinctive material loved by generations of NERF fans, the new NERF-branded gear will range from everyday technology accessories to action items designed for imaginative play. " Other SKUs include a 2GB PC/Mac-compatible flash drive shaped like a mini-NERF blaster, a 2GB digital MP3 player, walkie talkies with up to a 1000-foot range, and a multi-function flashlight. 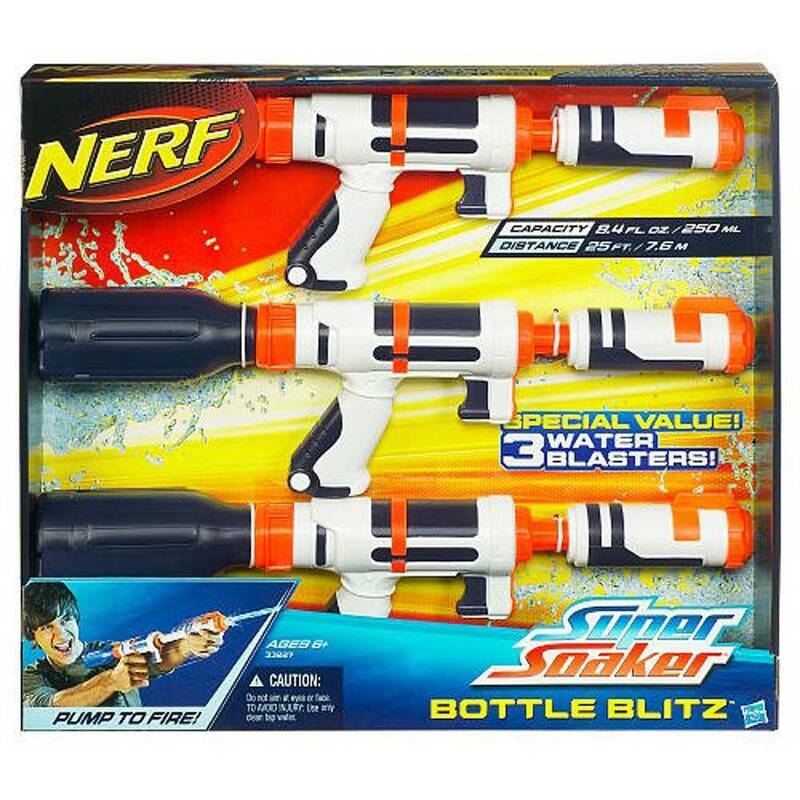 Bottle Blitz 3 Pack: when..2 isn't enough. Several months ago, we brought to your attention the amazing box art "concepts" from Nerf's Box design peeps- Indigo Studios. 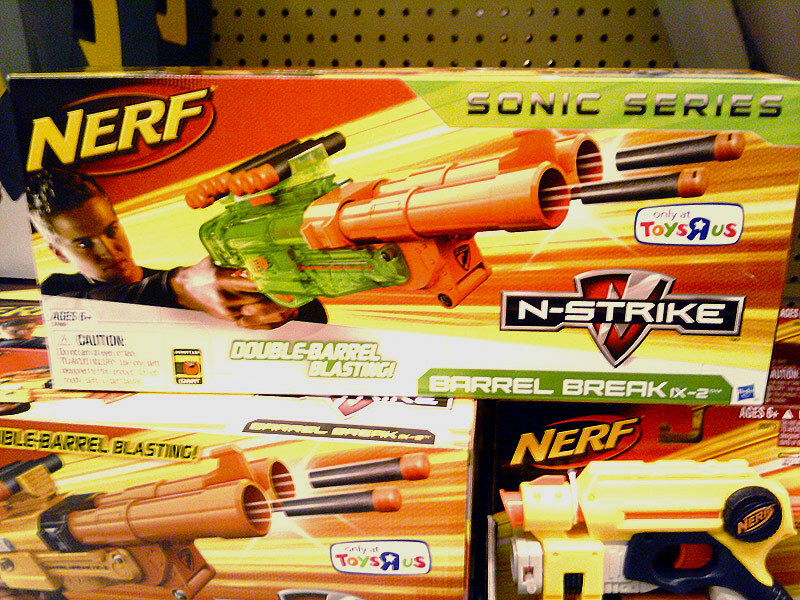 At the time we thought they were just showcasing what they could do, and produced designs for the Sonic Barricade REV-10, Longstrike CS-6, Stampede ECS and the Whiteout Spectre REV-5. What's interesting is a peruse of Toys R Us in the US has the Longstrike available in Sonic finish for $35 US. What's more interesting is the release of the pics of a Sonic Series Barricade RV-10. That's two of the four "concepts" that have made it to release.. which now makes us wonder..
A sonic series Stampede ECS might ACTUALLY be coming? Or that uber hot Whiteout Spectre REV-5..
Looks pretty sweet. 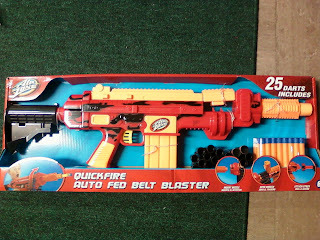 Apparently a flywheel clip(oops) belt fed blaster with allegedly pretty decent ranges. It's going to be a big hit just on it's design and aesthetics alone, don't you reckon? 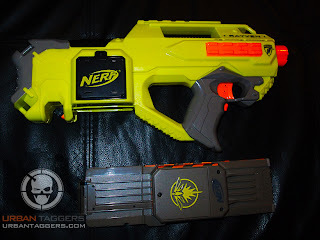 More on it at Nerf Mods + Reviews. 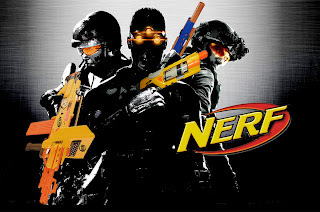 More news of them on Nerf Mods + Reviews.